"They trained him to kill for their pleasure ... but they trained him a little too well"
Spartacus was directed by Stanley Kubrick and Anthony Mann and starred Kirk Douglas as the titular slave, Spartacus who leads a slave revolt against the ruling Roman Empire. The film is based on true historical events surrounding a slave revolt led by a slave called Spartacus in 73 B.C. ; the events of the film were dramatized for a novel of the same name by Howard Fast and adapted for the screen by Dalton Trumbo. The film was produced by Kirk Douglas's Bryna production company to cash in on the trend for historical epics that had seen the earlier Ben-Hur be a large hit. Upon beginning production Douglas and Universal Pictures stated to the press that Trumbo was the screenwriter despite his blacklisting during the 1950's McCarthy era anti-communist witchhunt. By publicly announcing Trumbo as screenwriter and not forcing him to use a pseudonym Douglas and Universal Pictures helped bring an end to the blacklisting of Hollywood figures in the 50's and 60's. Spartacus tells the story of a slave called Spartacus who is unwilling to be ordered around by his Roman employers; his unwillingness to work as a slave forces his owner to make him a gladiator forced to fight to entertain Roman's of all social classes in the Colliseum. While fighting and training as a gladiator Spartacus begins a feud with General Crassus, played by Laurence Olivier; Spartacus is given a female slave who he falls in love with called Varinia, played by Jean Simmons. Seeing the close relationship between Spartacus and Varinia General Crassus takes the slave away and forced the gladiator trainer to use Spartacus's anger to make a better gladiator. An ensuing fight turns into a riot and the gladiators escape their captors to flee to the Roman countryside. Once free the gladiators are joined by more slaves who wish to fight for their freedom; despite not feeling he has the intelligence to lead the revolt Spartacus is elected the leader of the group and leads the slave army towards the sea and their freedom. In a series of battles the slaves defeat the Roman army until they finally fall to a larger Roman army; following their loss the slaves are offered freedom if they give up Spartacus. In the famous scene each slave stands and declares themselves Spartacus. Eventually, Spartacus is found and crucified as he is comforted by Varinia. 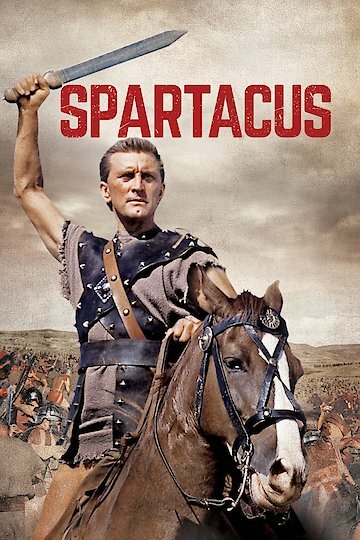 Spartacus was seen as a controversial movie at the time of release; many anti-communist groups picketed the film because of the use of screenwriter Trumbo and the film's apparent sympathy for socialist causes. This was Stanley Kubrick's first big budget Hollywood movie after he replaced initial director Anthony Mann after the first week of shooting. Spartacus is currently available to watch and stream, download, buy on demand at Amazon Prime, Amazon, Vudu, FandangoNow, iTunes, YouTube VOD online.